Reliable and affordable domestic cleaning services in White City W12 performed by professionally trained cleaners from First Class Cleaner. Get a free and non-obligatory quote now! There is no doubt that the house chores can be really time – consuming, especially if you don’t have the right detergents. Having a neat and tidy home makes a good impression and helps you maintain a healthy environment so your family feels cosy and protected. However, if you can’t find enough free time to do the cleaning, feel free to call the best company in London. There is no need to stay at home during the cleaning visit. Provide your maid with a spare key and a cleaning checklist and rest assured your directions will be followed. All the tedious cleaning tasks will be performed on your behalf – ironing, vacuuming, folding clothes, sanitising the bathroom. 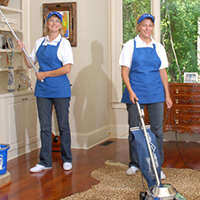 And the best of all is that the excellent domestic cleaning service and the benefits it brings come at a really sensible price. All you are supposed to do in order to take advantage of this incredible offer is to get in touch with our call centre representatives and ask for availability at the day and time that is most convenient to you. We guarantee that your preferences will be taken into account and a skilful and dedicated maid will be sent to your property at the agreed time. No matter if you choose weekly or a fortnightly service, you will always get the same incredible cleanliness.